What is CA Service Desk Manager? 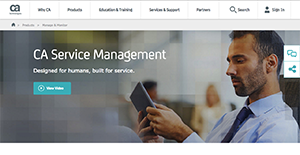 CA Service Desk Manager is a complete set of support and service functionalities, ranging from service requests, change, incident, knowledge, and configuration management for businesses from various industries. CA Service Desk Manager is basically a unified service desk application that offers all stages and service desk operations. Already a powerful, compact and comprehensive platform, CA Service Desk Manager also provides users with integrated collaboration and social media features. Available as a software-as-a-service (SaaS) and on-premise software, CA Service Desk Manager enables users to take a proactive approach to IT service management while effectively diminishes business expenditures and risks. Every enterprise has its own characteristics, and can need a particular type of Help Desk Software solution that will be fit for their company size, type of customers and employees and even specific industry they support. It's not wise to count on locating a perfect software that will work for every business no matter what their background is. It may be a good idea to read a few CA Service Desk Manager reviews first and even then you should keep in mind what the service is supposed to do for your business and your staff. Do you need an easy and straightforward service with just elementary functions? Will you really make use of the complex tools required by pros and large enterprises? Are there any specific features that are especially practical for the industry you work in? If you ask yourself these questions it will be much easier to find a reliable service that will fit your budget. How Much Does CA Service Desk Manager Cost? Pricing is available on a quote basis. Contact CA Service Manager directly for more pricing details. We realize that when you make a decision to buy Help Desk Software it’s important not only to see how experts evaluate it in their reviews, but also to find out if the real people and companies that buy it are actually satisfied with the product. That’s why we’ve created our behavior-based Customer Satisfaction Algorithm™ that gathers customer reviews, comments and CA Service Desk Manager reviews across a wide range of social media sites. The data is then presented in an easy to digest form showing how many people had positive and negative experience with CA Service Desk Manager. With that information at hand you should be equipped to make an informed buying decision that you won’t regret. What are CA Service Desk Manager pricing details? What integrations are available for CA Service Desk Manager? Pros: I like the fact that the navigation panel responds quickly and doesn't slow down as you use it. You don't need to wait for long for it to load once you are signed in. Thus, you can work faster. It is a great and efficient management tool for logging in and tracking information and getting information for reporting or auditing purposes. Cons: The tool is not user friendly to some extent because the right click button on the mouse cannot paste content in the tool as I would like. Pros: The best part of this application is the ease to customize the service desk to how you want it to serve you. It does everything and even more than what I need it to do. Cons: There a couple of disadvantages. First, the knowledge base feature does not work well when searching for keywords. Second, you can only run the application effectively in Internet Explorer. Third, there are a lot of unnecessary and constant pop-ups that open in different windows during surfing. Lastly, sometimes there are excess options that makes it very hard to identify which one you were searching for in order to perform a specific desired function. The best part of this application is the ease to customize the service desk to how you want it to serve you. It does everything and even more than what I need it to do. If you need more information about CA Service Desk Manager or you simply have a question let us know what you need and we’ll forward your request directly to the vendor.